Few weeks ago, I had the opportunity to attend the NIVEA Make Up Clear Launch event, whereby the products from the Make Up Clear range was officially introduced. Of course, other than bagging home some products from the range, we learnt quite a few tips about the harmful effects of wearing make up for long hours and also the consequences of not removing your make up properly – most of which I never really knew about! For those who do not know (though I'm pretty sure you do), NIVEA is one of the most recognised and trusted skin care brand in the world, and the products are effective, yet available at an affordable price. Personally, I really like NIVEA's products and was really excited to try out the new ones! The new NIVEA Make Up Clear range offers a convenient yet effective cleansing routine, with products that cater to all types of make up users as well as individuals with different skin types! 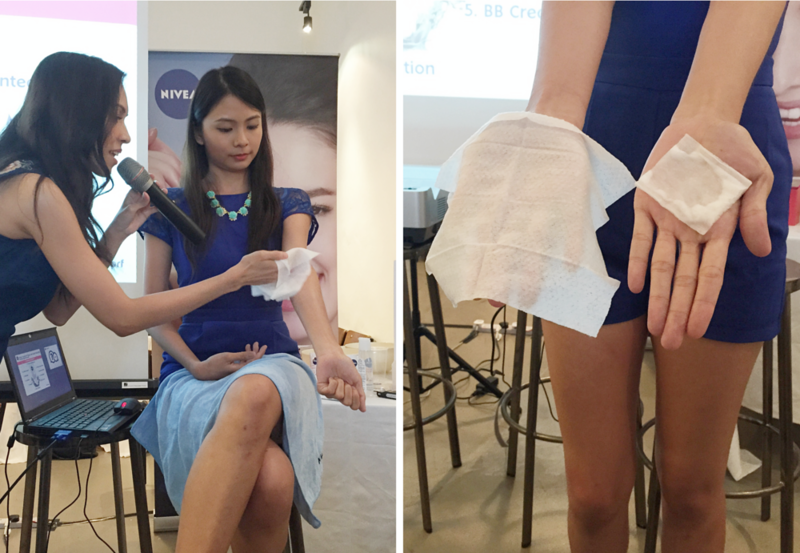 Here's Xin Lin, the NIVEA girl for year 2015, demonstrating to us the effectiveness of the star product of this range, the NIVEA Make Up Clear 3-in-1 Mud Cleanser. This product is definitely #NotYourRegularCleanser as it promises to clear 10 types of make up on the skin, including: make up base, concealer, foundation, powder, BB cream, blusher, bronzer, brow pencil, tinted moisturizer and tinted sunscreen. And it's seriously amazing because of it's ability to act as a mask, make up remover and cleanser all at the same time (thus it's 3-in-1!). We watched the live demonstration as the 10 types of make up including: make up base, concealer, foundation, powder, BB cream, blusher, bronzer, brow pencil, tinted moisturizer and tinted sunscreen were applied onto Xin Lin's arm as per how we girls would usually apply them. As each type of make up were gradually applied, I was quite honestly thinking to myself "How can a cleanser possibly remove all of that? I would totally need a make up remover to do this." I was quite hoping to see someone evaluate the efficacy of the mud cleanser by further wiping Xin Lin's arm or something because I simply couldn't believe my eyes as I watched the make up gradually being gradually removed by the mud cleanser. Moving on, the host then went on to wipe Xin Lin's arm with the NIVEA Make Up Clear Cleansing Wipes as well as Micellar Water on a cotton pad to check for any residues that weren't properly removed. Of course, as per any of you would, I thought there probably would be some stains or residue on the wipes or cotton pad, because some times even with my current make up remover, I would need two cotton pads to completely remove the make up before cleansing my face with a facial cleanser. But I was impressed to see there really weren't any residues left! I'm definitely pretty amazed by the 3-in-1 Mud Cleanser, but nothing beats having to try out the product yourself, yes? Pardon the lighting, but you can see a significant difference between both of my hands, and definitely my left hand seemed 'clearer' and 'brighter'. Other than the NIVEA Make Up Clear 3-in-1 Mud Cleanser, the NIVEA Make Up Clear Micellar Water is definitely another of my favorite product from the range, because they serve different purposes... and I'll share more later! Now, here are some tips I've learnt from the event, and these tips relate to the harmful effects of wearing make up for long hours, importance of proper cleansing and also the consequences of not removing your make up properly. Like most of you girls, I have grown and matured over the years and as we grow older, experimenting with make up seems to get more interesting. Gone are the days of "nah, I am too lazy to put make up". In fact, I always have to leave house with drawn brows, under eye concealer and lip color now. Of course, many of you would think that 'more make up = covers up more imperfections', but little do you know that excessive and over-use of make up actually leads to skin infection, also known as dermatitis. Yes, there's always that one hideous pimple that pops up right before an important occasion or event that you wish you could get rid of, and you try to pile up as much make up to cover up the spot. Did you know, such can actually lead to clogged pores and more acne? As much as possible, I try to avoid putting on too much make up and tend to stick to only concealer, blusher and highlighter. I have this mindset that foundations, BB creams and tinted creams all acts as a 'plastic layer' that prevents my skin from breathing, and I'm pretty sure it's true to a certain extent. When your skin don't get much air, they age prematurely over time and that's where saggy and wrinkled skin comes along. Tip 4: NEVER, ever go to bed without removing make up! This may sound ridiculous but I have heard of friends who do just that after a night out parting or clubbing, and their reason would be "I'm too tired to remove my make up, I can just do it tomorrow". That is the biggest NO ever. Night time is where our skin cells regenerate the fastest and where the skin is more receptive to the surroundings. Leaving your make up on will not only slow down regeneration of skin cells but also lead to seriously clogged pores. If you aren't convinced, click HERE for a comparison study to see the harmful effects. Try the NIVEA Make Up Clear 3-in-1 Mud Cleanser or NIVEA Make Up Clear Foam Cleanser! You may be wearing make up everyday but you make the effort to ensure you remove them every night when you reach home, but you still get acne and spots popping up... Ask yourself, are you sure your make up is thoroughly removed? Because even a little bit of make up left on your skin can cause harm, especially waterproof mascara, eyeliner or eye make up since they may lead to eye infection or inflammation. That is why you have to dispose of your used mascara every 6 months. 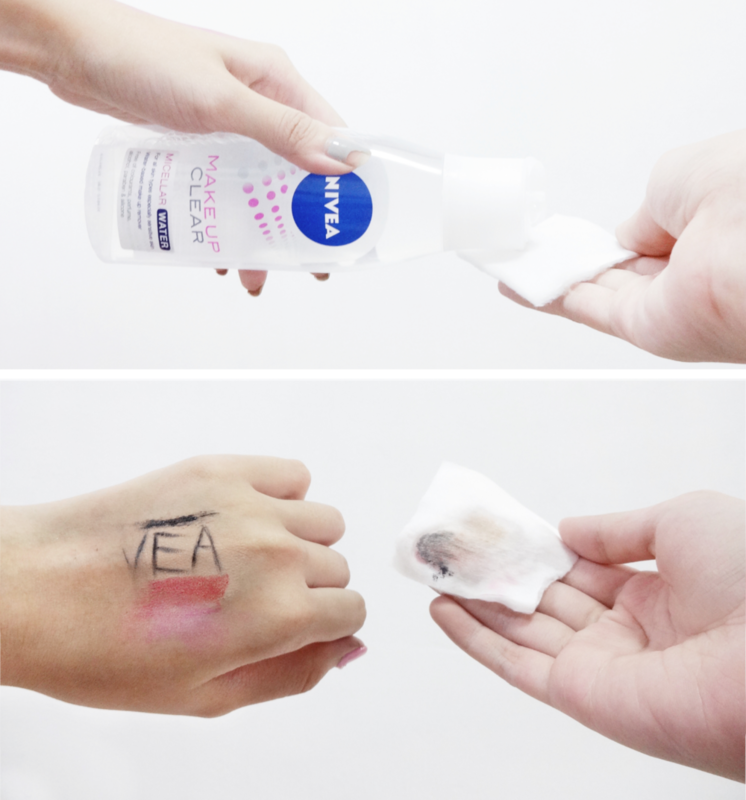 Try the NIVEA Make Up Clear Micellar Water or NIVEA Make Up Clear Cleansing Wipes. If you have dry skin and you use a facial cleanser meant for oily skin, you may end up having drier skin since facial cleanser for oily skin tends to strip off more oil from your skin! Likewise for oily skin, not using a suitable facial cleanser may result in more oil produced on your skin, which may lead to acne or clogged pores. Don't over-cleanse your face or you might find that the nutrients as well as natural oils are all stripped off from your skin, making your skin produce more oil, resulting in oily skin. When do you put in make up? I do, in the situations above, be it hanging out with friends, heading to school or even when I'm out to take photos for my social media platforms or even for events. Putting on light make up has been a norm for me and I hardly ever leave house without concealer for under eyes, brows slightly filled (had done brow resurrection last year), blusher, highlighter and lip color. But one thing I dread is having to remove my make up especially if I come home late at night at about 12am to 1am, all tired and could fall asleep any moment. Imagine coming home late at night and tired, yet having to removing make up, then take a shower, brush my teeth and still cleanse my face with a facial cleanser before putting on skincare products to ensure my face is fairer and more hydrated. As a lazy but vain girl, that's such a chore but I still have to do it because who doesn't want nice skin? I know I do! I'm thus so glad that the NIVEA Make Up Clear 3-in-1 Mud Cleanser came along. This is the NIVEA Make Up Clear 3-in-1 Mud Cleanser that I've been raving throughout the entire blog post, and it's specifically targeted at light make up users. You know it's good as it can remove up to 10 types of light make up such as: make up base, concealer, foundation, powder, BB cream, blusher, bronzer, brow pencil, tinted moisturizer and tinted sunscreen. That is brilliant for me as someone who uses 4-5 out of the 10 products above. Many of us would think that anything non-visible on the skin (think skin-colored cream or powder, tinted sunscreen or products with SPF) wouldn't need to be removed "since they aren't seen anyway", but no – these products need to be removed properly too as it might lead to infections or acne! I love that this cleanser serves so many purposes and yes, tried and tested – it DOES remove the 10 types of light make up easily! Not only does it remove them effectively, it contains Pearl Whitening Complex which has 10x better whitening efficacy (based on in-vitro study) compared to Vitamin C, making your skin 10x fairer too! 1. To be applied as a mud mask to absorb make up, impurities, residues and thus unclogging pores. 2. At the touch of water, the grey 'mud mask' turns into a white milky cream of watery consistency and it becomes make up remover. 3. Using water to gently rinse off, the product cleanses as foam with whitening effect. Below, I have concealer, blusher, highlighter on my cheeks and I'll be showing you how I use the 3-in-1 mud cleanser to remove half the make up on half the side of my face. In Step 1, I mentioned to leave the mask on for a minute or two before adding some water. This step isn't actually necessary as the mud mask can be removed immediately without any waiting time. But for myself, I would prefer to leave it on for at least a minute just to get some self-assurance that the mud mask will thoroughly absorb all the make up. Here's a close up of my skin after using the NIVEA Make Up Clear 3-in-1 Mud Cleanser, and this photo was taken right after the photos for the step-by-step guide were taken. Absolutely no make up on this half of my face (well, except for the lip color that I obviously didn't use the cleanser to clean with!) I love how my skin was instantly brightened, and more importantly, there weren't any trace of make up left. This is definitely #NotYourRegularCleanser! I've been using it everyday (when I do go out and apply make up) and it serves me really well, removing my light make up and cleansing my face at the same time, perfect! It is gentle and has no skin-thinning ingredient or any sort that does harm to my skin, and so far it hasn't been giving me any spots, pimples or irritation. I think this cleanser would be perfect for girls who often travel, because you wouldn't have to go through the trouble of having to pack varieties of make up remover and cleanser altogether! You must be wondering though... What about mascara, eyeliner and other make up products that weren't listed. How do I cleanse them then? Well, fret not because NIVEA Make Up Clear also has the Micellar Water and Cleansing Wipes that you can use along with your 3-in-1 Mud Cleanser for a double-cleansing effect, which is really popular with Koreans who have wonderful skin. We all know Micellar Water has been really popular recently, because it is water-based and pretty much leaves our skin feeling hydrated, yet not greasy or sticky unlike oil-based make up removers might. Even better, micellar water is a no-rinse formula – which means you don't even need to wash off with water! The best part is that it is able to remove even the strongest and most waterproof mascara or eyeliner you can find. The NIVEA Make Up Clear Micellar Water is especially great for sensitive skin as it is gentle yet able to remove the most stubborn of all make up products. It is also free of any alcohol, paraben, silicone, colorants or perfume, making it even more suited for individuals with sensitive skin. Personally, I find this convenient on days where I'm lazy but on most days, I would opt for double cleansing with this micellar water together with the mud cleanser. I did a little experiment here to show you how good the NIVEA Make Up Clear Micellar Water is at removing waterproof make up, so here I have the waterproof mascara and gel eyeliner on top of my usual concealer, matte lipstick and powder blush on the back of my palm. To remove make up using the micellar water, simply pour a little of the product on a cotton pad and leave it for a few seconds on your skin. Then, with one swab, the make up gets removed from my skin. I would go for one or two more swabs to ensure all the make up is thoroughly removed with the cotton pad. My skin was left feeling slightly cold, smooth and hydrated. With the Micellar Water, you can use it to clean off heavier make up (waterproof products, eyeliner etc) before using the 3-in-1 Mud Cleanser, and this double cleansing regime would ensure your skin is completely free of make up residue. 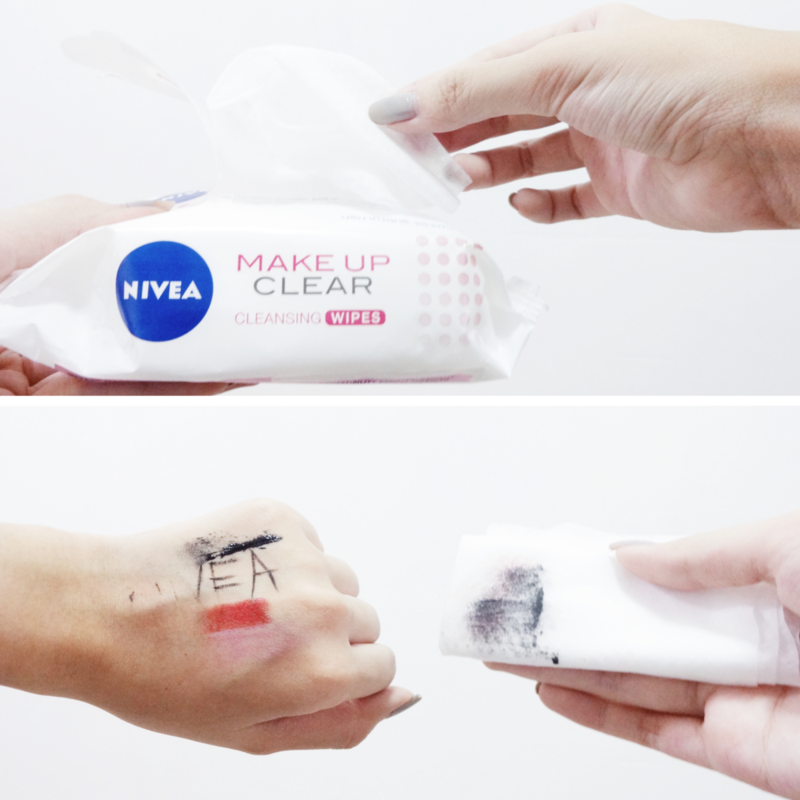 With effects similar to the micellar water, I find that the NIVEA Make Up Clear Cleansing Wipes are conveniently packed into a pocket-sized packet that comes in handy on the go. They are much more convenient as compared to standing by the basin having to splash your face with water, and do not even require the use of additional cotton pads since these wipes are pre-soaked in make up remover. While they remove make up well, I find that they do not cleanse deeply as compared to a cleanser, so it's best when the cleansing wipes are used prior to using a cleanser for a deep double cleansing effect. As per what I did using the micellar water and cotton pad, I used the NIVEA Make Up Clear Cleansing Wipes on waterproof mascara and gel eyeliner on top of my usual concealer, matte lipstick and powder blush too. The results were pretty impressive! In one swab, I managed to pick up 99% of the products, leaving a little gel eyeliner residue. Similarly, it was easily removed with the second or third swab. Specifically for oily skin, the NIVEA Make Up Clear 3-in-1 Foam Cleanser also serves 3 different purposes: make up remover to remove the 10 types of make up, cleansing foam with whitening oil control effect, and toner for tightening pores. I would say this is pretty much similar to the mud cleanser, except that this is made for individuals with oily skin! Since I don't have oily skin, I hadn't tried this product because as per what I shared above (Tip 6: Get the right facial cleanser), using a cleanser made for oily skin might end up drying my skin! If any of you managed to try this 3-in-1 Foam Cleanser, do let me know the results and your thoughts on the product! The NIVEA Make Up Clear 3-in-1 Scrub acts as an exfoliator to remove dead skin cells as well as to unclog pores. It serves 3 different functions: removes make up residues, cleansing scrub for exfoliation, toner to tighten pores. As it's an exfoliator, I use it only once a week after using the mud cleanser. I like that there are some tiny beads that helps to exfoliate my skin, and I can actually feel my skin 'cleaner' and fresher after use. It's really important to exfoliate and remove your dead skin cells every once in a while so that new cells can generate and your skin will stay smooth and healthy looking! This post might be a little lengthy but I'm pretty sure you guys might have picked up a tip or two from here, as well as learnt more about the brand new NIVEA Make Up Clear range! Which product do you think would be most suitable for you?